Hello, Come and discover this amazing place onboard our superb boat we are renting, a Marvel 930, a RIB, available in Glyfáda, Greece. 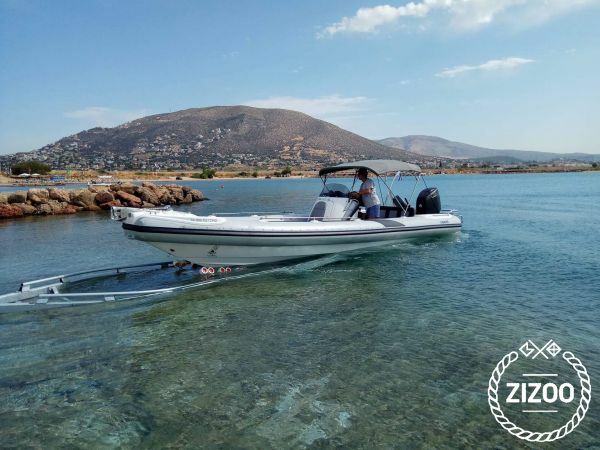 MARVEL 930 one of the best inflatable Greek boats as it combines comfort with safety and lightness in the way it navigates. (Portability 8 persons) It is the perfect compromise between performance, confort and design. Its line design is perfect, you can fit 8 pers on board with confortable seats, and enjoy the sun during the day on the nice sundeck. It is a great boat to discover the several and magical island we have here, very authentic and beautiful. You can then find the perfect place to spend the day, and jump in this see through water, enjoy a perfect time with your friends or your family. Built: 2006 Restored: 2017 Length: 9,30 m Pax: 8 Engines: Suzuki 300hp & Auxiliary 9,9hp Cruising speed: 29 kn Max speed: 42 kn Fuel capacity: 480 lt Fuel consumption: 43 lt/hour Equipment: GPS plotter, MP3 player, VHF, anchor winch, sun cover, fresh water with shower, ice box-igloo, No warranty fee is required if the boat is skippered. If you are interested in spending a great time on board, please contact me via Click and Boat messaging. See you soon!